Over the past several years, Comscore has run thousands of studies in validated Campaign Essentials™ (vCE®) nearly every industry vertical and, in doing so, has accumulated a lot of findings about the ability of campaigns to deliver in-view impressions to a target audience. We have compiled our U.S. studies into our recently published vCE Benchmarks, which we hope will deliver our clients some valuable perspective in understanding the relative performance of their campaigns. 1) There’s no such thing as normal. 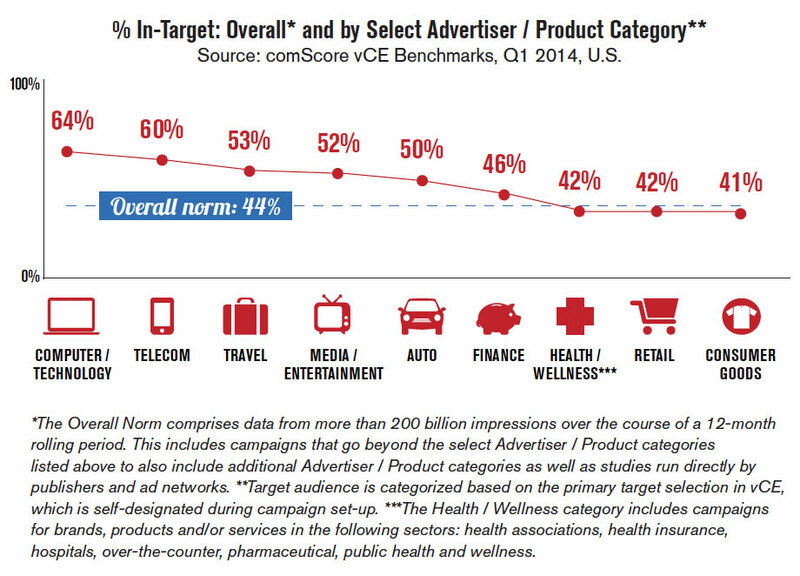 Normal can vary based on campaign objective, size of target, placements and verticals. 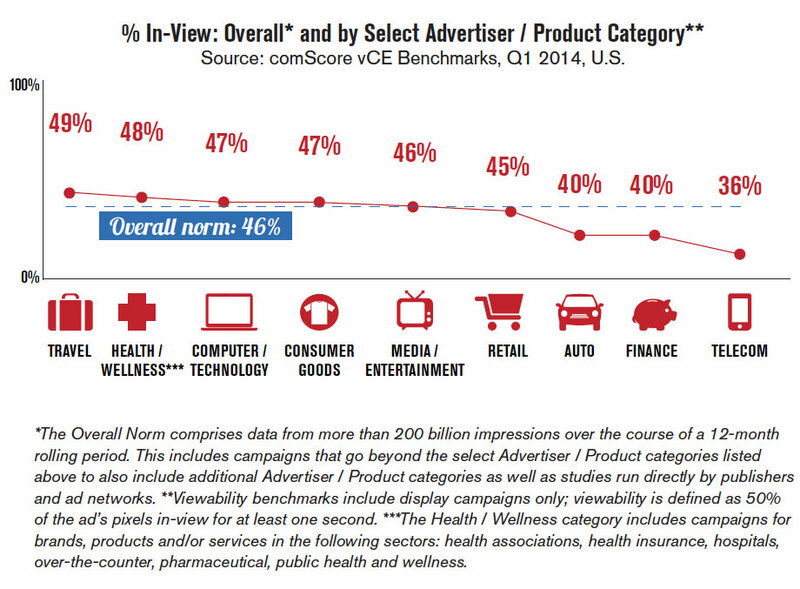 In fact, it is not uncommon to see variance in normative data across a variety of advertiser categories. 2) 100% in-target delivery and 100% in-view delivery isn’t feasible. When it comes to audience delivery, cookie targeting and demographic data can be flawed, making it tough to reach 100% of your target. And, in the case of viewability, a person might scroll off the page before the ad loaded or non-human traffic can drive up impression counts, which aren’t thus considered in-view. With these two truths in mind, normative data is still a very powerful and useful benchmark when assessing the delivery of a campaign. After all, having answers to questions about relative campaign performance can play an important role in the campaign planning and evaluation process. The analysis, which focuses specifically on viewability and in-target delivery across a variety of demographic groups, leverages a multitude of U.S. vCE campaigns comprising more than 200 billion impressions over the course of a rolling 12-month period. It includes a diverse set of advertisers with either brand-building or direct-response objectives. The analysis of audience delivery found an overall average in-target rate of 44%. This means that across all campaigns in the normative data set, 44% of the impressions reached the intended target audience. Certain categories such as Computers/Technology had in-target rates as high as 64%, while others such as Consumer Goods (the largest measured category by total impressions) had in-target rates as low as 41%. Download the report to find out the drivers of this variation. The analysis also showed that the more targeted the campaign, the harder it becomes to reach that target audience. 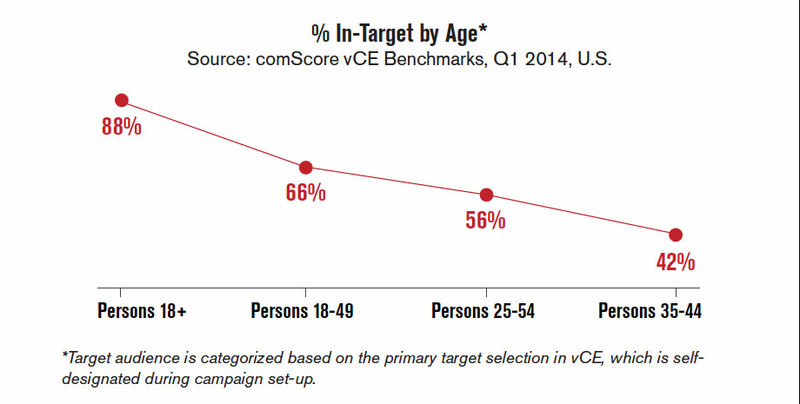 This is why understanding the size of the demographic target and the likelihood of hitting that target relative to broader targets, via a tool like Comscore MMX®, is a critical component of normative campaign analysis. The following set of data highlights just how varied in-target delivery can be based on the size of the target group. For example, there are far more Persons 18+ online than Persons 35-54 (as reported in MMX), which explains why it is easier to reach Persons 18+. Not only is there variation by age, but we also observed significance differences in in-target delivery when between Female and Male groups. These and other demographic findings are also detailed within the report. The analysis of viewability across campaigns in the database found an overall average in-view rate of 46%. This means that across all campaigns in the data set, 46% of the campaign impressions had the opportunity to be seen by a consumer. Importantly, this percentage remains essentially unchanged from a global in-view rate we released in Mid-2013, suggesting that on balance viewability has not yet begun to improve. However, as more publishers use tools like validated Media Essentials (vME) to optimize their content for viewability, we expect to see these rates improve over time. There are a variety of reasons why impressions might not be in-view, and many of them are outlined in Figure 2. One of the most common reasons is non-human traffic (NHT). According to the IAB-proposed guidelines for viewable impressions, ads served against NHT should not be counted as viewable impressions, which is why vCE filters out NHT as part of its viewability reporting. The vCE Benchmarks booklet provides deeper analysis of these normative insights, helping to shed light on why some Advertiser / Product categories performed better than others. You can download the full report here, along with other media buyer and seller resources associated with this topic.